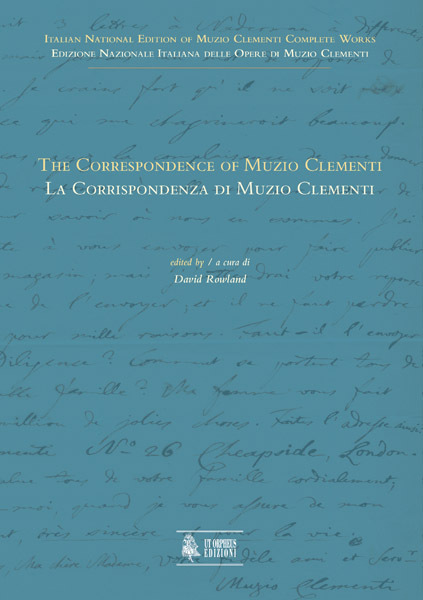 The critical edition of The Correspondence of Muzio Clementi includes some 20 previously-unknown letters by Clementi himself, in addition to about 30 more that were written to him, his family or associates, or by those other individuals. Furthermore, many letters only previously referred to or partially quoted are published here in full, along with previously unknown passages found in new sources such as the notebook used by both Clementi and his grandson Herbert Clementi-Smith, now in the possession of John Collard. Clementi’s correspondence opens a window on a number of aspects of his own life, the lives of other contemporary musicians, and the international music business of the time. One of the benefits of publishing all of the known letters to and from Clementi, his family and his business associates is that much more is revealed than has hitherto been known about the nature of Clementi’s company, and more generally the nature of the music business in early nineteenth-century Europe. The letters clearly show the extent of Clementi’s contacts with European publishers and instrument sellers, including Artaria, Breitkopf & Härtel, Erard, Naderman, Nägeli, Pleyel, Ricordi and Streicher. One of the most striking features of the correspondence is the evidence that it provides for the esteem in which Clementi was held among musicians all over Europe, as well as the use that he made of his reputation. His relations with Haydn, Dussek and Beethoven are well-known, but other figures emerge in this correspondence who have not been so closely associated with Clementi in the past, such as Bomtempo, Himmel and Righini, as well as very minor figures about whom very little is known, such as Nezot. In summary, the correspondence reveals an intelligent and cultured British citizen, a good friend, an energetic musician who was at the heart of the development of London’s musical institutions, and an extremely astute and well-connected businessman.